I decided to write about something a bit more technical for this week’s iDevBlogADay post: Xcode Folder References. They’re really quite simple, but I keep seeing projects that don’t use them when they should. 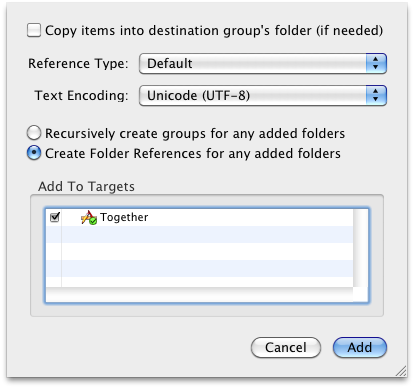 There are two types of folders in Xcode: groups and folder references. You can use groups to organize files in your project without affecting their structure on the actual file system. This is great for code, because you’re only going to be working with your code in Xcode. On the other hand, groups aren’t very good for resource files. On any reasonably complicated project, you’ll usually be dealing with dozens – if not hundreds – of asset files, and those assets will need to be modified and manipulated from outside of Xcode, either by you or a designer. Putting all of your resource files in one flat folder is a recipe for disaster. This is where folder references come in. They allow you to organize your files into folders on your file system and keep that same folder structure in Xcode. You can create folder references by ticking the “Create Folder References for any added folders” radio button when you’re adding files to your project. You’ll now see little blue folders in your project instead of yellow folders. The blue folders are folder references. Pretty simple. Great! But now our code has become really long winded, so let’s simplify this with a macro(you could also use a C function, a class method, or even a category on NSString). Yes! When you’re using folder references, you usually have to do a clean every time you do a build if you’ve changed any of the assets. In the process of writing this blog post, I stumbled upon this article on folder references by @MajicDave. Our posts cover some similar ground, but his goes into detail about how to solve this issue so that you no longer have to do a clean. Very handy. This entry was posted in iDevBlogADay, iOS Development, Workflow. Bookmark the permalink. Holy crap, I didn’t know Xcode could do that! Thank you thank you thank you! of same named files in separate directories? Was just googling for whether UIImage imageNamed supports folders in the resource bundle. Now I don’t have to experiment to find out, thanks Matt! Thanks! This was really helpful, I had multiple folders with same named resources and couldn’t find a way to choose which exact resource to load.